The Narrow-leaf Java Fern is a relatively new plant on the aquarium scene. It is a variation of a regular Java Fern that has much narrower, longer leaves. The leaves never get wider than a centimeter or two (less than 1 inch) but otherwise the growth requirements are just as easy. It doesn't need a lot of light and will survive in just about any amount. However, it will do best in medium to high light. It can tolerate almost any temperature and any pH, just like the regular Java Fern. 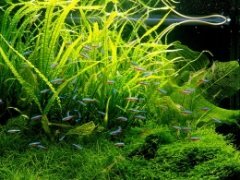 It also grows quite slowly, but does not need CO2 or large amounts of fertilization. It is ideal for placement on driftwood or rocks as it roots onto objects and does not need to be (and should not be) planted in the substrate. The true beauty of this plant is its ease of care combined with its unique long wavy leaves. 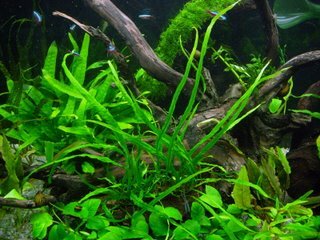 If grown in bunches, stands of these leaves add a wonderful affect to the aquascape. Or, you can plant a single plant on driftwood and have it grow long leaves and look like a tall grass. Either way, it is virtually indestructible. Propagation is easy, simply split the rhizome or separate plantlets that form on the ends and undersides of leaves. The only things to watch out for are to make sure you don't bury the rhizome (the big root/stem that all leaves sprout out of) in substrate and make sure it doesn't get covered in algae as it is a slower growing plant. You can't go wrong with this easy to grow, beautiful variation on a Java Fern. This fern is one of the best plants I have ever grown. It is simple to care for, looks great, and propogates with ease. I cannot recomend it to highly.